So I'm moving to Barcelona for a couple of years for B-school. One of the alums of the school I'm going to put up a post saying she's renting out her season ticket for the upcoming season. The pass incluldes League + Cup + CL. The quoted price is EUR 1,700. Now I've been quite keen on exploring this opportunity, but many members have mentioned to be wary of renting tickets due to scams that happen. However, since she's an alum of my school, I think the trust factor is established. Having said that, can someone tell me how this deal sounds? I have absolutely no idea how much season tickets generally get rented out for. The location of the seat is "Segona graderia. Porta 5. Boca 303. Fila 22. Num 6." Can someone in the know please give me some guidance? How is the price for these seats and would this make sense? She mentioned that she will transfer the money she gets when I "Free up" the tickets, to me. Considering all this, does this make sense? Also, can someone tell me how do I check where exactly these seats are located? I tried looking this up online, but I wasn't able to find "Segona Graderia" everywhere. Look forward to hearing from you guys living in BCN. Thank you so much! The price of the season ticket depends on the location inside the stadium. I dont know how much it actually is for a season ticket in the location you said, but of course you will probably pay more for it than what the person renting it out did. Either way, if you were planning on going to every game 1700 is a lot cheaper than buying single tickets every time. The location, from the looks of it, is in the second tier of the stadium, in the stand called ”tribuna”. Second tier, to the left in tribuna. Thanks for the reply @Galning. I found this picture, and it seems Boca 303 is just left of center and comes under the "Premium" category. The seat definitely does look good. 1.) 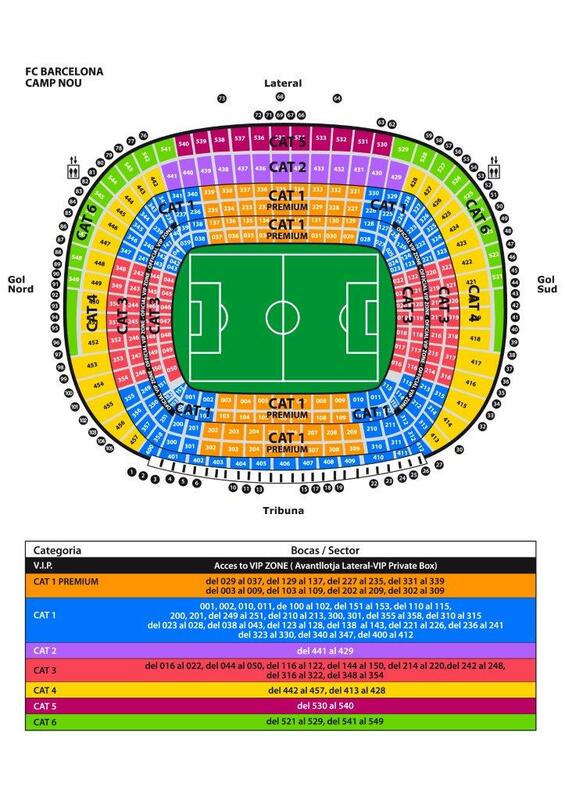 Can you help me with the average price of a ticket for a big game like a clasico or CL game? My thinking behind this is that if I'm going to spend 600 - 800 euros on just the big games alone (clasico, CL, ATM) then maybe this is worth it? 3.) Most importantly - how do season pass members go for games with their friends? If I have a pass, is it easy enough to get tickets for my friends in seats nearby? or do season pass members all go alone, unless they have family members with seats next to them? This last point is what I'm most concerned about actually! Last edited by Neeraj; 11th June 2018 at 07:56 PM. 1) The price depends a lot on where you want to sit, even for standard tickets. But it will be over 140€ per tickets for sure if you want a decent seat. 2) I don't know if someone has to buy your seat, but I assume so. Anyway, you don't get the full price back. As far as I know it is a percentage. 3) Yea most people with season tickets have more than one. You can always buy extra tickets if someone wants to come with you but then you will just have to use the normal procedure, which means you have to buy a ticket in a place close to your seat. Even if your friend isn't sitting next to you most of the time people are nice enough to switch seats if you explain the situation.. unless it is a big crowd of course. But for small games you can just ask, or just change seats during the game if you see there are some free seats somewhere. @Galning I'm planning to subscribe for the waiting list for a season-ticket. Is the waiting-list still as horrendous as it used to be before (20 years or so?)? Yes, a while back I was checking how long it would take and eventually found some numbers from a few seasons ago. Judging from those numbers, if the same trend continued of members getting season tickets, it would take 25-30 years. Which is absolutely laughable. Only hope is that when the stadium expansion happens they will free up a lot of the new seats to people on the waiting list but to be fair we all know these places will go to sponsors, people who know someone on the inside, etc.